This video explores the relationship between whānau and the school. It highlights the new learning (unlearning / relearning) that leaders and teachers need to consider as they prioritise a focus on developing educationally powerful connections with whānau and the Māori community. Look at the key elements of success (p.5) from educationally powerful connections with whānau, hāpū and iwi and consider which elements are explicitly evident in this clip? What is less evident? Discuss the roles whānau and members of the Māori community currently have in your school. How do these roles connect (or not connect) with teaching and learning? Consider what further opportunities there might be to build on and further develop your school’s relationship with whānau and the Māori community. Anne talks about Māori students, whānau and staff being able to talk with her in the staff room, “They know I’m sitting at my table.” How does Anne’s space in the staff room challenge traditional power relations in schools? “We’ve had quite a lot of good engagement from a soft perspective – so in relation to sport, in relation to kapa haka. Where we haven’t really hit it well is around that engagement in the learning - so we’re trying to connect the dots between whānau, the student and the teacher” (Daniel). Thinking about Daniel’s comments above, consider how your school currently engages with whānau. How does your school ‘connect the dots between whānau, the student and the teacher’? Who is involved? What else might you do? Daniel talks about “creating an organisation that is culturally responsive to not just the students but also community and whānau members”. Discuss what engagement with whānau would look like and sound like when the principles of culturally responsive and relational pedagogy underpin those relationships. This video presents a view of relationships between whānau and the school that challenges traditional power hierarchies. After viewing the following video interview with Dr Mere Berryman (Connecting with BES) discuss the implications of these ideas for your school? The video opens up the possibility that ”breaking down of who owns which part of the school .. that the students, teachers and whānau have an equal share in what’s going on” disrupts traditional hierarchies of power. 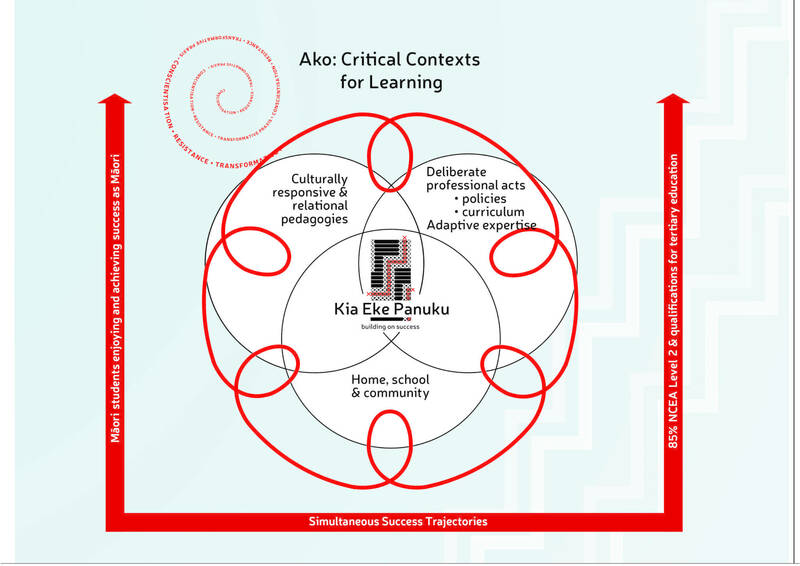 How does the current iteration of your Kia Eke Panuku action plan demonstrate a pathway towards shared ownership of the school? What else needs to happen to build on from your current situation?